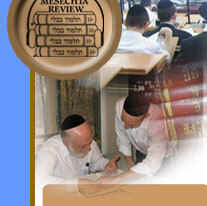 ...An exciting and innovative audio “chazorah” system which helps you review and REMEMBER the daily daf. Each Tape/CD/DVD Shiur (English) provides the highlights of every daf in a well communicated and easy to follow format. Because each 60 minute shiur covers an average of 20 Blatt, you can easily review an entire week of shiurim in under 20 minutes! Imagine really being able to remember all the famous Gemoras you wished you would remember! Are the Daf Yomi Mesechta Review Shiurim endorsed by Gedolei Yisroel? Who are the Maggidei shiur for this Daf Yomi Shiur? Can I try out the Daf Yomi Mesechta Review without risk?